We’ve seen a lot of Twitter accounts hacked in the last few years. In case you've forgotten, here’s a recap of the best. Back in 2010 a teenager in Detroit, Michigan hacked into the Twitter account of one of Bieber’s friends and stole the pop star’s phone number. All part of the burden of fame, right? Just take it in stride…right? In a stroke of revenge, Bieber found the hacker’s mobile number and posted it to his own account. The hacker, Kevin Kristopik, later posted a YouTube video showing messages and calls coming into his mobile phone faster than he could delete them. While Brittany’s music may have controlled the minds of teenage girls, there are some who think the pop singer is in control of a lot more. Some crazies people think she is a member of a secret society that worships the Devil and works to bring about the end of days. And a few years ago, an enterprising hacker played to these theories and revamped Spears’ account with demonic imagery and tweets about establishing the “New World Order” and kicking off the apocalypse. We reported the Donald’s twitter hack a couple of posts ago, but it definitely merits re-mentioning because although it was relatively short lived, it was hilarious. Yep. Donald rapping. So good. Last month marked several Twitter hackings, but American auto brand Jeep definitely turned out among the most amusing. The hackers that commandeered the account claimed the brand was sold to Cadillac and that the company was having problems because its executives were using crack cocaine. Admittedly, not super clever, but pretty extreme as far as Twitter hacks go. 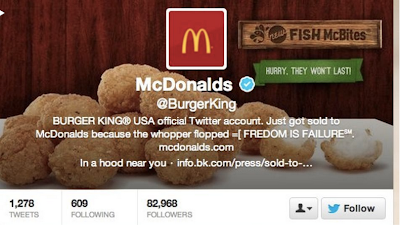 The same week that Jeep fell prey to hackers, Burger King too found their account compromised. 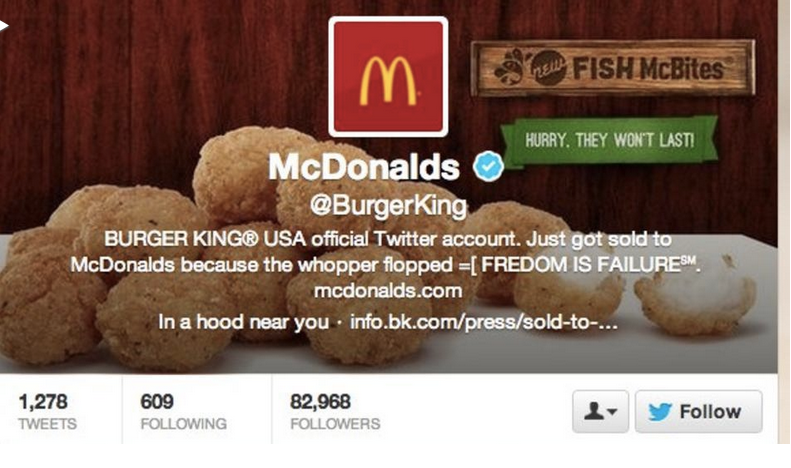 On the bright side, Burger King gained around 5,000 new followers in the first 30 minutes of the hack. In late December, the bone-headed Westboro Baptist Church announced plans to picket the funerals of children murdered in the Sandy Hook Elementary school shooting. The church tweeted they would picket "to sing praise to God for the glory of his work in executing his judgment." 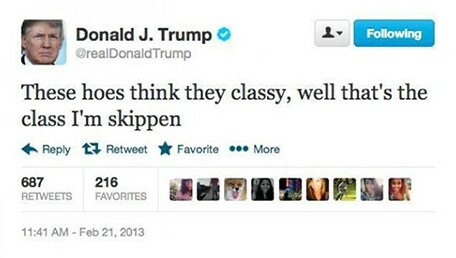 Real classy. In response — a little dose of social justice. A 15 year-old hacker who goes by the alias, Cosmo the God, took over WBC spokeswoman Shirley Phelps-Roper’s account (@dearshirley) and posted a White House petition to officially label the church as a hate group. We will not allow you to corrupt the minds of America with your seeds of hatred...We will not allow you to inspire aggression to the social factions which you deem inferior. We will render you obsolete. We will destroy you. We are coming.